Craving for lechon? 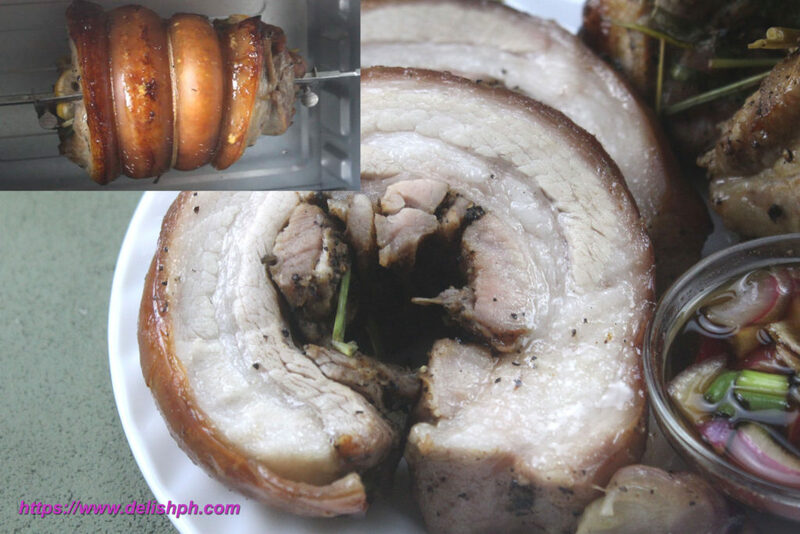 Well then, you can satisfy your cravings with this delicious Lechon Pork Belly recipe. You can cook them at home, with your own spices and flavors on it. 1. Make diagonal slits on the pork belly slab. Season with chili powder, brown sugar, salt and pepper. Massage all over the flab. Rub some salt on the skin side as well. 2. Arrange all the filling all over the flab. Lemon grass, green onions, onions, garlic and lemon slices. 4. Stick the Rotisserie’s Rod in and make sure to lock and secure it on both ends. 5. Set the oven to Rotisserie setting at 250°C. Cook the pork belly for 2 – 3 hours. 4. Serve with your favorite dip! This is probably the simplest version of lechon pork belly. But you can always add more spices that you want. If you have any question and suggestion about this recipe, drop a comment below or send me an email or message us directly on our Facebook Page.